This was one of my favourite spots in the entire Antarctica trip. 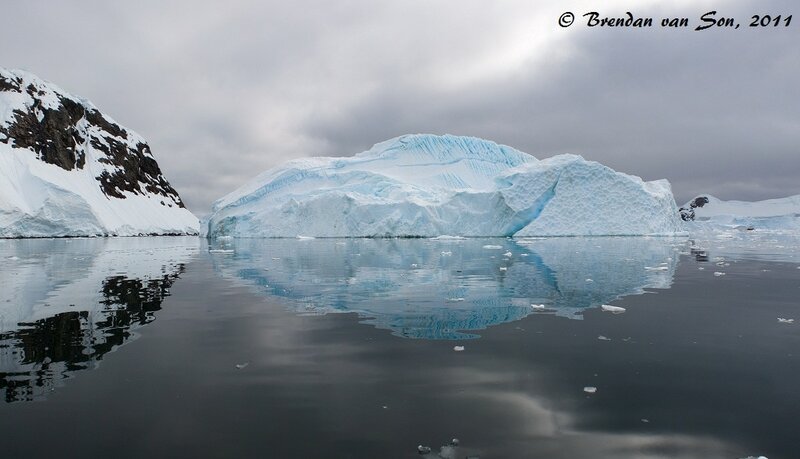 The place was called Wilhelmina Bay, and was filled with magnificent icebergs, It was also walled by huge glaciers that fed into the bay from the Antarctic Peninsula. Light had been something I was a little bit worried about when shooting Antarctica. Having scheduled trips at midday generally means that the harsh mid day sunlight would burn out the colour and cause the whites to washout in many cases. However, the light low level clouds actually made a great light filter and exposed the great blues in the ice. I shot this from a zodiac with my Canon 70-200mm 4f IS. I couldn’t fit the entire scene in with the longer lens on so I had to get creative. I flipped the camera vertically and fired a round of shots and stitched them together in a panoramic. People often forget that you can take panoramas with the camera flipped vertically. If you’re a photo geek, you’d like to know I shot this at f 7.1, 1/500 sec. ISO100, at 155mm. Nice shot Brendan! The water is just incredible there. Amazing shot!! I got one just like that when I went… Can’t wait to see more! Real cool. I’ve tried to shoot vertical panoramics like that before and had mixed results. Did you just stitch and then crop in photoshop? I think of the “titanic” when I see a picture of an iceberg. haha. I love reflection pictures like this! When I take photos, I try and take one of these anytime water is around. The water looks so calm. Very beautiful! Stunning!! The blue ice is amazing! Stunning. An no ripples from the Zodiac. I need to get here one day. Must see. Great shot.